" Excellent! Nice to have the reassurance and pointed out fatty liver which would otherwise have gone un-noticed. " Our first line health profiles are specifically tailored to provide a picture of how various aspects of the body is looking, functioning and performing. ✔ Detect problems before they become troubles. ✔ Our health checks are performed by qualified experts. What is included with this test? A written ultrasound report of the examination including any measurements within 24 hours after your appointment. 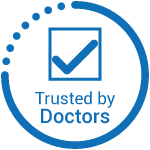 We pride ourselves on providing the best quality service we can which is why we are trusted by GP's, doctors, physiotherapists, midwifes and many other healthcare professionals. Our mission of better quality healthcare for everyone really sets us apart from the vast majority of other clinics and is the main reason why we are amongst the few diagnostic clinics to not only be approved by but also provide services to the NHS and thus the general public. This also means that unlike many other clinics we have additional strict quality control measures which we must adhere to meaning you are in safe hands with us and our team. You will be seen by a healthcare professional who specialises in clinical medical ultrasound. Unlike other diagnostic tests which produce results for analysis, ultrasound imaging is "real- time" therefore the quality of the scan being performed is the basis of the information you take away and heavily depends upon the expertise, experience and skill of the healthcare professional scanning you. This is an important point which is often overlooked by many people when deciding where to go, therefore you can be reassured that at The Scan Clinic you will always be seen by an expert who has vast expertise and experience in the field of medical ultrasound. A full bladder is required – Please drink 1 litre of fluid approximately 1 - 1.5 hours before your scheduled appointment and please try your best not to empty your bladder before the examination. You will need to have been fasting from food for at least 6 hours prior to having this scan, however you may drink clear fluids such as water. If you are diabetic then maintain your normal food intake but try your best to avoid fatty or dairy products for at least 6 hours prior to having the scan. An ultrasound scan is a painless test that provides images of the inside of the body by using high frequency sound waves. These sound waves are at a frequency which cannot be heard by the human ear but when they bounce off different parts of the body, create echoes that are picked up by the probe and turned into a moving image. Unlike other scans such as MRI and CT, ultrasound does not involve radiation and is in real time i.e. live imaging and is not static i.e. still pictures. 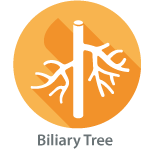 This live information is interpreted and is used as the basis of the subsequent diagnostic report. There are many kinds of ultrasound scans that can be performed as ultrasound has numerous applications in healthcare and are ultimately beneficial to us if used in the right context by a competent body or person. However as with any test, ultrasound scans have limitations some of which are generic to all scans such as not being able to visualise bone clearly or scan specific and therefore may not be suitable in certain situations and like any test can not diagnose every problem. For further information about ultrasound please click here. 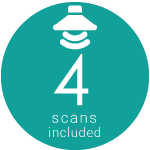 We will require details of your GP / Health Care Professional, which may be requested prior to or at the time of the scan. This scan requires access to the area of interest, therefore it is recommended to wear loose clothing to facilitate this process. Study images may be available at an additional charge - more information and to request this can be found by clicking here. Award Winning Clinic First class service from the No.1 Clinic Trust We are trusted by midwives, doctors and many different health professionals Location A Few Minutes Walk from Gants Hill Tube Station (Central Line) Parking Car Parking Available at Clinic. Pay & Display Opposite. Excellent! Nice to have the reassurance and pointed out fatty liver which would otherwise have gone un-noticed.